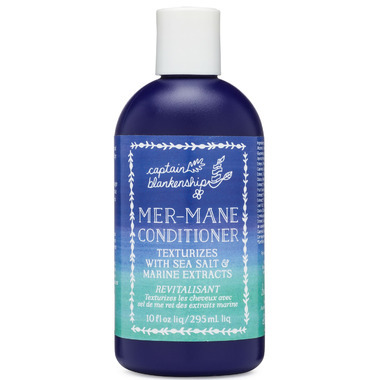 Mer-Mane Conditioner is a volumizing and texturizing plant-based conditioner that leaves hair nourished, shiny and buoyant. It is made of a nutrient dense formula composed of organic aloe vera, organic plant oils, shea butter, sea salt, organic seaweed and botanical extracts. The essential oil based scent of red grapefruit, blood orange, lemongrass and rosemary is bright and uplifting. Available in both 10oz full size and handy 2oz travel size. Ingredients: Aloe Barbadensis Leaf Juice,* Glycerin, Brassica Alcohol, Betaine, Sea Salt (Maris Sal), Shea Butter Glycerides, Glyceryl Stearate Citrate, Cocos Nucifera (Coconut) Oil, Apricot Kernel Oil Polyglyceryl-4 Esters, Babassu Oil Glycereth-8 Esters, Phospholipids, PCA Glyceryl Oleate, Caprylyl Caprylate/Caprate, Glyceryl Laurate, Crambe Abyssinica Seed Oil Phytosterol Esters, Tocopherol, Macrocystis Pyrifera (Kelp) Extract,* Urtica Dioica (Nettle) Extract,* Rosmarinus Officinalis (Rosemary) Leaf Extract,* Beta Vulgaris (Beet) Root Extract, Hippophae Rhamnoides (Sea Buckthorn) Fruit Extract,* Phyllanthus Acidus (Indian Gooseberry) Fruit Extract,* Spirulina Maxima Extract,* Fucus Vesiculosus (Bladderwrack) Extract,* Althaea Officinalis (Marshmallow) Leaf/Root Extract,* Chondrus Crispus (Irish Moss) Extract,* Rosmarinus Officinalis (Rosemary) Leaf Oil,* Citrus Grandis (Grapefruit) Peel Oil, Citrus Aurantium Dulcis (Orange) Peel Oil, Helianthus Annuus (Sunflower) Seed Oil, Cymbopogon Flexuosus (Lemongrass) Oil,* Inula Crithmoide Flower/LeafvExtract, Euphorbia Cerifera (Candellila) Wax, Lauroyl Lysine, Levulinic Acid, Sodium Levulinate, Caprylic/Capric Triglyceride, Glyceryl Undecylenate, Polydextrose, Carrageenan, Alcohol, Sodium Phytate, Sodium Anisate.